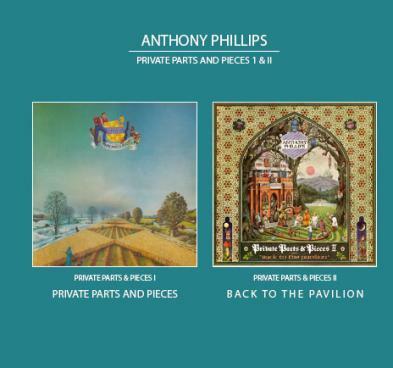 The re-issue of Anthony's back catalogue continues in 2010 with the release of the first two albums in the Private Parts & Pieces series (Private Parts & Pieces and Back To The Pavilion) as a double CD set. Both albums have been newly re-mastered for this release by Simon Heyworth and Private Parts & Pieces also features an extra track in addition to the two included on the previous CD release of the album. Retailing at the price of a single CD, this re-issue represents excellent value and provides a perfect opportunity to sample the Private Parts & Pieces series. Private Parts & Pieces was originally released in the US in November 1978 and was subsequently released in the UK the following April as a limited edition pressing to accompany the first 5000 copies of Anthony's 1979 release Sides. Subtitled 'A collection of guitar and piano solos, duets and ensembles 1972 - 1976', the pieces on the album represent some of the best material that Anthony had written and recorded in his home studio during this period. Highlights include Field of Eternity, Tregenna Afternoons and Reaper. When the album was re-issued on CD for the first time in 1990, Anthony took the opportunity to include two extra tracks - a new recording of the song Stranger and a demo version of Silver Song. Both of these tracks are included on this re-issue together with a 1976 recording of Movement IV from Guitar Quintet, which is released here for the first time. Private Parts & Pieces II: Back To The Pavilion was originally released in the US in April 1980 and in the absence of a UK release proved popular enough as an import title to top the HMV chart at the time, ahead of releases by the likes of David Bowie and AC/DC. Back To The Pavilion afforded Anthony the opportunity to release more of the music that he had written and recorded at home between 1972 and 1979 alongside tracks recorded for the originally planned version of Wise After The Event and the pilot for an educational release that would combine rock music with dialogue from Shakespeare plays. Tracks from the latter project make up The Scottish Suite and feature musical contributions from Mike Rutherford and former King Crimson and Greenslade drummer Andy McCulloch, whilst highlights of the solo pieces include Nocturne, Spring Meeting and Lindsay. This re-issue includes the extra track included on the previous CD release (a new recording of Lucy: An Illusion) as well as new sleeve-notes detailing the recording of the individual tracks on Back To The Pavilion.